Dinnington RUFC Under 13’s returned from their recent tour of Northumberland, supported by Basilisk Data, along with Hi-Lo UK Ltd and Harker's Security in supplying special Tour Shirts for all the youngsters who took part in the weekend. It was a weekend of mixed results. 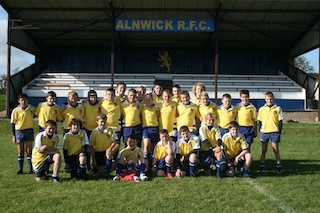 They won one match against Percy Park RFC, and lost the other match against Alnwick RFC, but were team building and enjoying themselves the whole time.